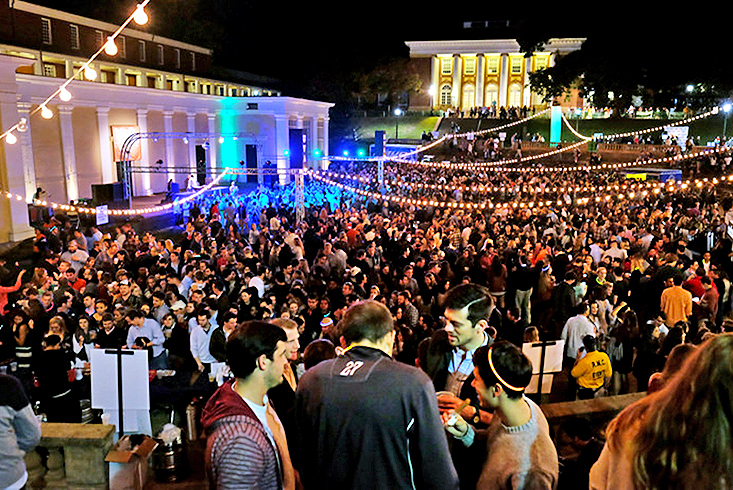 UVA Reunions | Conference Services, U.Va. For those looking for an affordable, no frills alternative to a hotel with no minimum stay requirement, we provide student-style accommodations in air-conditioned dorm rooms. 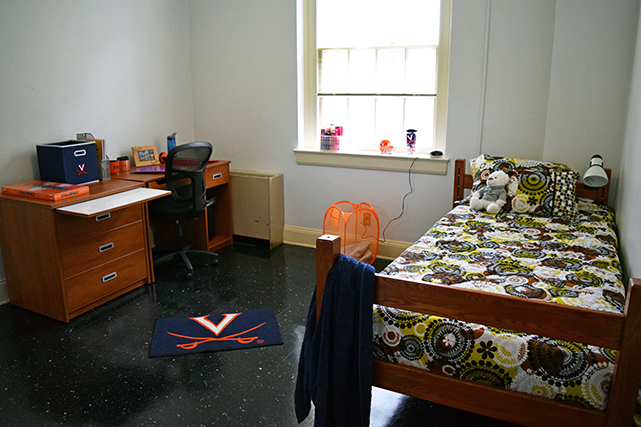 This year we are offering traditional hall-style dorm rooms on Alderman Road, 2-bedroom apartments in Lambeth, and a limited number of 4-bed and 8-bed suite accommodations in Brown College (Monroe Hill) dorms, which are ideal for larger groups. Each guest will receive a linen package that includes a bed pillow, pillow case, two sheets, a bedspread, two bath towels, a washcloth, and a bath mat. An additional non-negotiable fee (outlined below) will be charged for this linen package. It should be noted that rooms are NOT equipped with hangers, irons/ironing boards, hair dryers, or area lamps (overhead lighting only). Guests are responsible for supplying their own personal toiletries, such as shampoo, soap, etc. 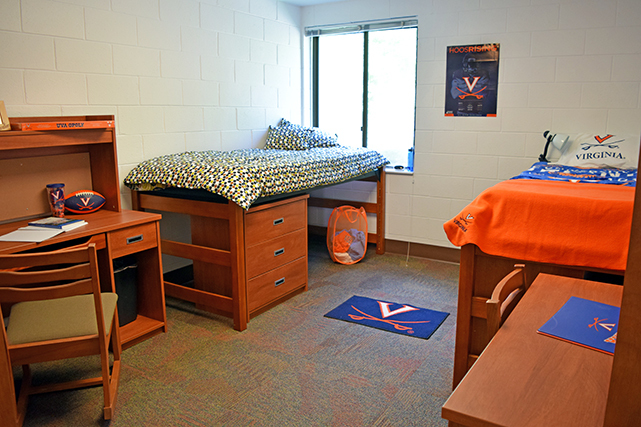 Should any member of your party require disability-related or medical accommodation during your stay for Reunions, please contact our office at conferences@virginia.edu or 434.924.4479. Newly constructed, these fully accessible, air-conditioned residences offer traditional hall-style accommodations with double-occupancy rooms and loft-style beds. The residence halls are about a 10-minute walk to the Lawn, include shared common lounges and shared gender-specific bathrooms. All rooms have two single beds, two desks, two dressers, and two wardrobes. Please keep in mind that the housing rates are per person per night. Reservations secure individual beds. While guests from different reserving parties will not share the same bedroom, guests within the same reservation group will be housed together in the same room. Each floor will have two shared common bathrooms, one assigned male and one assigned female. Back by popular demand, we are pleased to offer a limited number of suites in Brown College at Monroe Hill, which are ideal for groups of friends or families who want to be housed together. Guests may choose to reserve either 4-bed suites or 8-bed suites that are joined together by a shared bathroom. Each suite is air-conditioned and equipped with loft-style single beds. Please note that due to Brown’s unique layout, you are guaranteed to only share bathroom facilities and room space with members of your party reservation, and you will be required to pay for the full number of beds and linens in the suite regardless of whether or not your party will use all of them. If you choose either the 4-bed or 8-bed option, one person will pay for the entire suite, and we will contact you directly to obtain the names of all of your guests. Accommodations at Brown College are located on Central Grounds, and close to the action during Reunions weekend. These accommodations may not be suitable for those wishing a quieter stay. It should be noted that the suites in Brown are only accessible by stairs. If you require accessible accommodations, we recommend our Alderman Road housing option. This year we are offering an entire apartment option for groups of up to four guests in Lambeth Field Apartments. Each two-bedroom apartment is air-conditioned and equipped with two single lofted beds per room, a living room with dining area, full kitchen, and shared bathroom. At the time of reservation, you are required to pay for all four beds (and four linen packets) in the suite, regardless of whether or not your party will use all of them. The person who pays for the entire apartment will br contacted directly for the names of their guests. Parking permits for Scott Stadium are available for purchase by those staying on Grounds for Reunions, and are only needed if you arrive before 5:00 on Friday, as these lots are used by employees during the work day. Those staying in Lambeth may obtain parking permits for the parking lot at Lambeth.You may purchase parking passes at the Parking and Transportation office at 1101 Millmont Street (behind Barracks Road Shopping Center) during their office hours: Monday through Friday, 7:30 a.m.–5:00 p.m.
Should any member of your party require a special disability-related or medical accommodation during your stay, please be sure to fill out the Special Requests and Medical Needs section when you register, including the name of the guest and as many details as possible. We will do our best to make any necessary accommodations. If you have questions, please email us at conferences@virginia.edu before you register, and we will get back to you with answers. While all of our residence halls are accessible, there are a limited number of ADA parking spaces adjacent to the residence halls. Most accessible guest parking is not immediately adjacent to the accessible entrances of the buildings. It takes approximately 15 minutes to walk from the Alderman Road Residence Area to the Lawn. Parking on-Grounds is a challenge, and parking for Alderman and Brown housing options is located at the Stadium, which is about a 10- minute walk from these buildings. Parkin at Lambeth located adjacent to the apartment complex. Also, please see the University's accessibility map for the Alderman Road area. All reservations must be made online with a valid credit card. Please click on the appropriate housing option button below to begin. Payment is due at the time of registration. Any requests for guest additions at a later date are subject to availability. Alderman Road Hall-Style Dorm Rooms: Accommodations are reserved by the bed, per person per night. Only guests within the same reservation group will be placed in a room together. Please provide the names of all of your guests at the time you make your reservation. 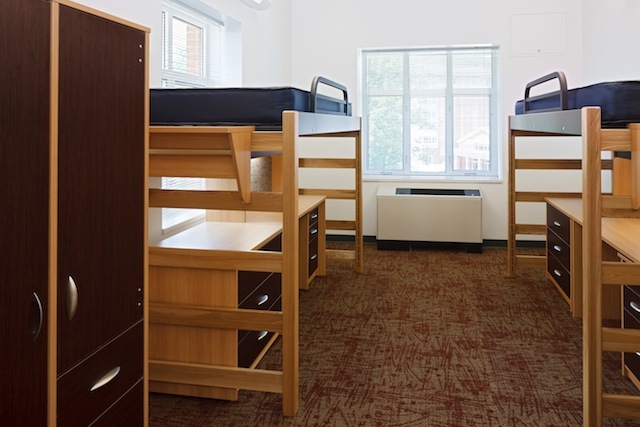 Brown College: Accommodations are reserved by 4-bed or 8-bed suite, per night. Due to Brown’s unique layout you will be required to reserve and pay for the full number of beds and linens in the suite regardless of whether or not your party will use all of them. Once your reservation for a Brown suite is made, Conferences@UVA will contact you directly to obtain the names of all of the guests in your suite who will need to be issued keys. 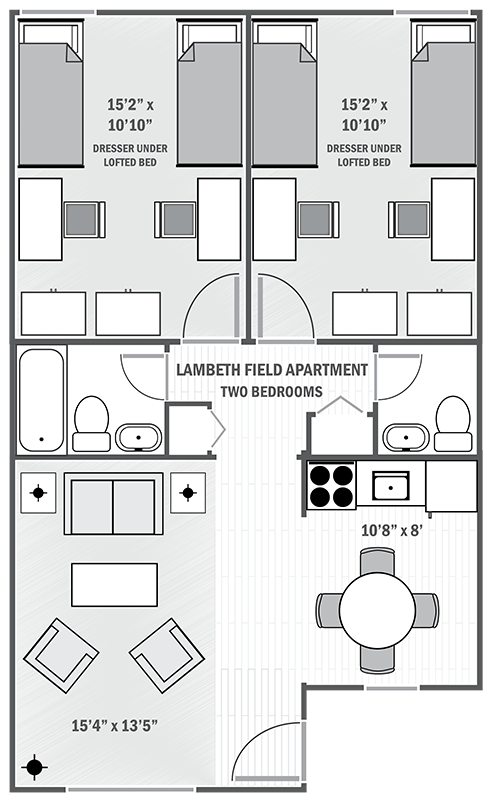 Lambeth Two-Bedroom Apartments: Accommodations are reserved by the apartment. Each apartment has two bedrooms, and each bedroom is furnished with two lofted single beds. You will be required to reserve and pay for the full apartment, which includes 4 beds and 4 sets of linens, regardless of whether or not your party will use all of them. Once your reservation for an apartment is made, Conferences@UVA will contact you directly to obtain the names of all of the guests in your guests who will need to be issued keys. Lawn and Range: Reservations for accommodations on the Lawn or Range are handled by lottery directly by the Alumni Association. Please contact them for information. 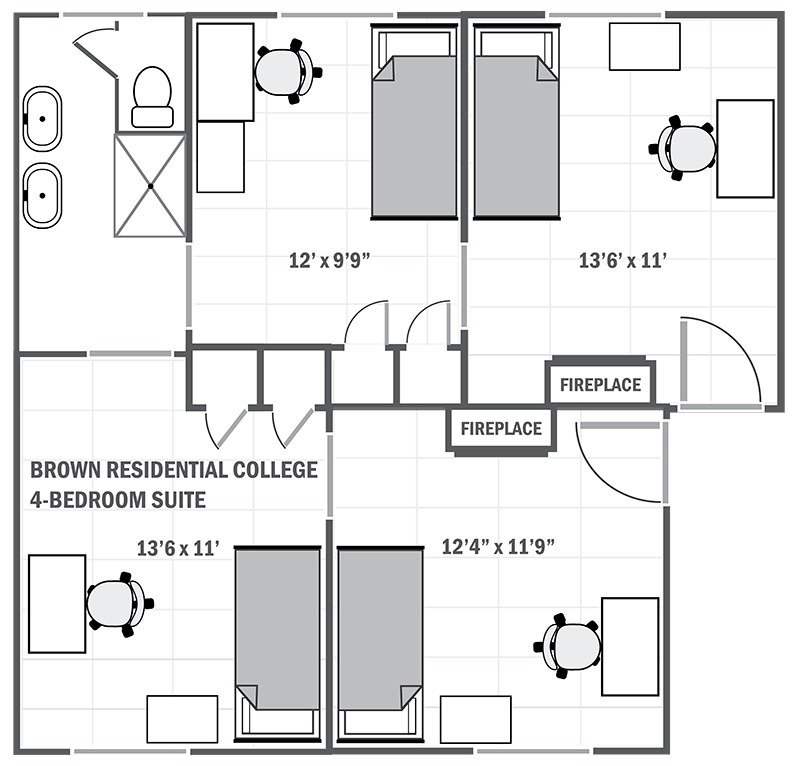 Brown College: Accommodations are reserved by 4-bed or 8-bed suite, per night. 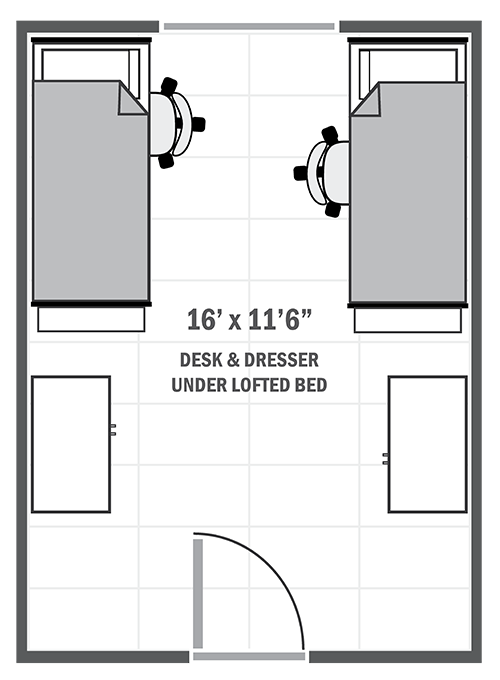 Due to Brown’s unique layout you will be required to reserve and pay for the full number of beds and linens in the suite regardless of whether or not your party will use all of them. Once your reservation for a Brown suite is made,Conferences@UVA will contact you directly to obtain the names of all of the guests in your suite who will need to be issued keys. Brown Four-Bed Suite -- SOLD OUT!